Thursday March 7 1907 I was at home all day I did a little sewing after supper Will and I caught some hens I am going to sell to Mother. I am working lace for a towel I worked on that in evening and read some. A letter from Sister Ida. Jennie Woolf here in afternoon for her butter. Friday March 8 1907 Will took Mothers chickens down this morning. I got the dinner. Will went back to town by car in afternoon. A letter from Lydia with one from W.H. [Worth?] tells of the serious illness of Esther [Thurber?]. I wrote them this afternoon. 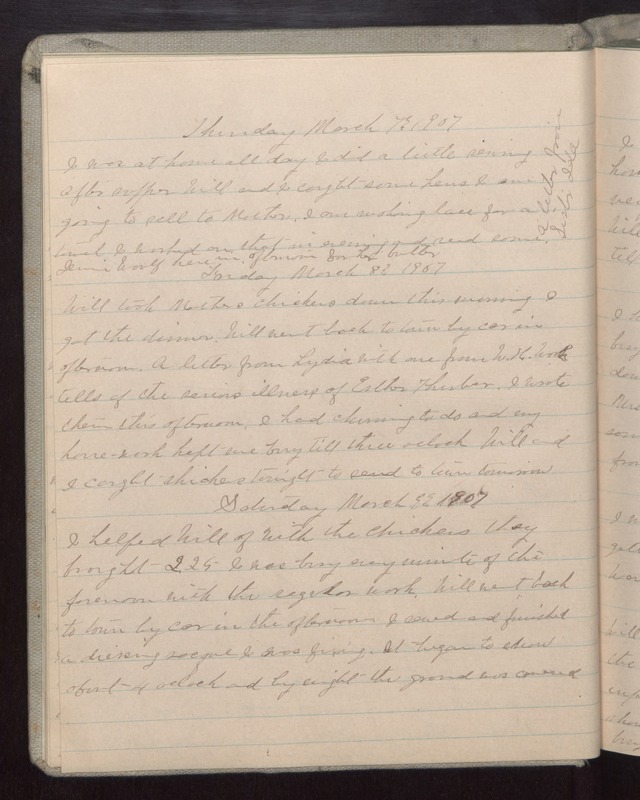 I had churning to do and my house-work kept me busy till three oclock will and I caught chickens tonight to send to town tomorrow Saturday March 9 1907 I helped Will of with the chickens they brought 2.25 I was busy every minute of the forenoon with the regular work. Will went back to town by car in the afternoon. I sewed and finished a dressing sacque I was fixing. It began to snow about 4 oclock and by eight the ground was covered.